Arthur Adams may be heralded as a new blues master, but hes been around a long time playing many different kinds of music. Growing up near Jackson, Tennessee, Arthur formed a gospel group with his cousins called The Gospel Travelers, but went on to play jazz and blues at college nightclubs near Tennessee State University. He continued his musical education by touring with Vee-Jay recording artist Gene Allison, who was promoting his top-40 hit "You Can Make It If You Try," but Allison left the band stranded in Dallas. Arthur backed up the likes of Elmore James, Lightnin' Hopkins, Chuck Berry and Lowell Fulsom, honing his blues chops with the best. Arthur Adams' new Blind Pig release, Back on Track, builds on a 40+ year career that has included sitting in with the Crusaders and the Jackson 5 as well as contributing to TV themes and movie soundtracks. Add to that mix solo LPs on Blue Thumb, Fantasy and A&M over the years and plenty of live gigs around the L.A. blues scene and you have one busy musician. 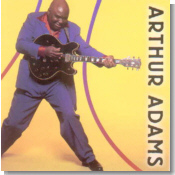 Arthurs sound is pure Memphis blues, bouncy horns and all, just like his mentor and friend, B.B. King. The King of the Blues joins Arthur on "Got You Next to Me" and "The Long Haul," two cuts co-written by Adams and composer Will Jennings (Jennings also wrote Placido Domingos "Why Do All The Good Times Go Away"). The funky "Who Does She Think She Is" features Arthurs fine fingerpickin blues, buoyed by some great sax. Adams holds his own on Back on Track with other originals like the title tune, "Backup Man," and "You Really Got It Going On." I'm glad Arthur Adams is Back on Track. Hes got the blues goin on, and its a great ride. Albert Collins would certainly be proud of one of his protégés if he could hear Tales from the Austin Motel (Shanachie) from Debbie Davies. This is one of her best CDs to date, not surprising as this time around she's backed by Stevie Ray Vaughan's old Double Trouble rhythm section, Chris Layton and Tommy Shannon. The dozen cuts here include a mixture of original numbers and covers, the latter given Ms. Davies' own touch so as not to be exact copies. The CD opens on a strong note, showcasing her excellent guitar playing, with an original number "Just Stepped In The Blues." Another creative song penned by Davies is the humorous "Bald Headed Baby," in which she talks about her man whose "...top of his head looks like one of my knees..." She pays tribute to the current java generation with the blues shuffle "Half Caf-Decaf." One of the best covers is her version of Willie Dixon's "I Want To Be Loved," a much sassier rendition than that done by Muddy Waters. Tales from the Austin Motel is one of the best contemporary blues CDs of the summer. One of the best-kept secrets in the blues world today is an East Coast harmonica player by the name of Steve Guyger. His new CD, Past Life Blues (Severn), features this strong harmonica player and good singer backed by a tight blues band led by drummer and labelmate Big Joe Maher. Guyger's harp style is similar to that of California counterparts James Harman and the late William Clarke. I'll bet that he too has listened to a lot of George "Harmonica" Smith over the years. That type of swingin', rockin' blues is especially evident on the original "We're Gonna Ride." Guyger does a nice version of Robert Nighthawk's slow blues classic "Bricks In My Pillow." Brian Bisesi's best guitar work can be heard on the blues shuffle "No No No." Past Life Blues is a solid effort, and definitely worth the effort to find it. Congrats to tiny Severn Records for still another excellent release! Paul Geremia, while never becoming as famous as acoustic guitar heroes like John Hammond and others, he's every bit as talented a musician. His latest, The Devil's Music (Red House) is an excellent album. Geremia presents a nice collection of 15 tunes, a well-chosen mix of originals and covers. 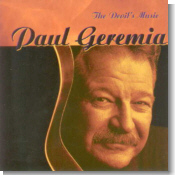 What surprised me most on The Devil's Music was Geremia's proficiency on the piano, best heard on his own novelty composition "How'd He Do It?" He's also a better singer than I remembered. Not just anyone can tackle a Percy Mayfield song and do it justice, but Geremia's version of "Lost Mind" is quite fine, and not just a note for note cover. Another favorite tune is Tampa Red's spirited ragtime number "The Way To Get The Lowdown." Geremia's strongest guitar work comes on the Blind Lemon Jefferson song "Stocking Feet Blues." I was worried that Scott Holt's new CD, Dark of the Night (EMC) was going to be too rocked out for my tastes. Holt's regular employer Buddy Guy guests on the opening "Breakin' Up Somebody's Home." This one was a lot too far out there to suit me, and I felt that Holt's vocals sounded forced. The second cut, "I Believe To My Soul," was marred by an annoying electric keyboard. But Holt then settled into a nice, funky blues groove, and most of the remainder of the disc was quite enjoyable. Everything comes together, including good backing vocals, on the funky "Train In Vain (Stand By Me)." I really liked Holt's guitar work on the Otis Rush number "Right Place, Wrong Time." But then the album drops off again at the end, closing with a lame version of Dylan's "You Gotta Serve Somebody" and the too frequently covered "Voodoo Chile." Jimi Hendrix's "Voodoo Chile" also shows up on the self-titled album on Marconi Records from Tony Sarno. This CD is more rock than blues, but Sarno is still a powerful guitarist. He really doesn't show off his blues licks until the seventh of nine cuts, the original "Get Out The Back Door." One cut which I really didn't think worked well was a cover of Lennon and McCartney's "Don't Let Me Down." They're back....arrrrggghhh! House of Blues Records has now released Tangled Up In Blues...Songs of Bob Dylan, including Dylan compositions performed by blues and soul artists. HOB previously issued similar collections of songs by The Rolling Stones and Eric Clapton, but this concept is starting to wear a little thin. What's next, old blues cats doing songs from Eddie Vedder or Van Halen??? I guess the Dylan connection isn't that much of a stretch, but I thought many of the covers sounded forced. The best cuts are Mavis Staples singing "Gotta Serve Somebody" and Alvin "Youngblood" Hart doing "Million Miles." But Isaac Hayes' "Lay Lady Lay" comes across as a little strange, although it's probably the type of song that will grow on me if I listen to it a few more times. The album closes with The Band doing "One Too Many Mornings," which kind of reminded me of their own rock classic "The Weight." Chicago blues ensemble Mississippi Heat's new CD, Handyman (Van der Linden) is a solid set of 13 songs, although I think that some of their earlier efforts were stronger. It's good, basic blues, but nothing overly exciting. Guest singer Billy Boy Arnold provides a nice moment on the slow blues "It Hurts To Be Lonesome." "Payday" is a nice feelgood blues featuring the vocals of Katherine Davis. You know about all those "enhanced" CD's, or "CD extras", which contain more or less interesting video footage to show off what you can do with technology? Tiny Stony Plain Records of Edmonton, Alberta, have chosen the low-tech approach to this trend. 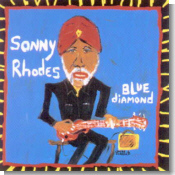 They chose to include an excellent 20-minute, audio-only interview of Sonny Rhodes at the end of his recent Blue Diamond CD. The rest of the album is on par with the interview: Rhodes' voice, though limited in range, is deep and pleasing, and his guitar playing is not flashy, but impressive. He plays the expected dobro and electric guitars, but what sets him apart is the fact that his preferred instrument is the lap steel guitar. This gives a somewhat country sound to some songs, counterbalanced by very soulful horns. Rhodes has come up with most of the songs himself, but to me the best of the CD is the very sad "Love From A Stone," composed by his rhythm section. And throughout, you can almost hear how much fun Rhodes has playing his music for people. The second release in this collection was made the year before in 1977. Muddy Waters himself was playing with his latter-day band. This release, Hoochie Coochie Man, might be slightly less essential than the preceding, simply because there are more "live" recordings of the big Mud out there. Surprisingly, the delicate touches of Pinetop Perkins' piano are clearly audible, while the guitar work of Bob Margolin and Luther "Guitar Junior" Johnson are hard to pick up. Muddy himself is in very good voice, and he lets Perkins join him on vocals for the closing number, "Kansas City." I don't know whether I should keep Kelly Joe Phelps' latest CD, Shine Eyed Mister Zen (Rykodisc), with my blues albums, or whether I should file it under "folk." Think of a modern day, white Leadbelly or Skip James, and you get an idea. Phelps composes songs and doesn't worry about making them fit the standard 12-bar blues form. He tells stories...long ones, sad ones, beautiful ones, of estrangement, or coming back home, of far away travels. If you like bare bones acoustic music, in this case Phelps' own unique slide guitar playing (he is accompanied by Dave Mathis playing harmonica on one song), if you enjoy lyrics that go much further than "I woke up this morning," then this record is for you. Greatly rewarding. If searing slide guitar is to your liking, then you will probably love the latest offering from Australia's Dave Hole, entitled Under The Spell (Alligator) The guitar slinger from down-under demonstrates some exceptionally strong songwriting throughout the twelve selections that comprise this disc. As always... Mr. Hole's dazzling fretwork is very eclectic. Raw edged and gritty one moment, melodic and painfully soulful the next, while keeping the listeners' attention from start to finish. The stand out tracks on this disc are "Holding Pattern," "Chicken Stuff," and "Cold Women With Warm Hearts," three shuffles that are sure to get your toes tapping and possibly your hips shaking, too. My only complaint with this CD is the same one I've had for years about this artist: A GOOD VOCALIST WOULD MAKE ALL THE DIFFERENCE. While Dave's vocals are adequate, they lack the punch that would make this an outstanding collection. Damon Fowler, the talented baby-faced and hot-fingered guitarist, has turned me into an eternal blues fan with both his performance as well as his album, Riverview Drive. Fowler, of the Damon Fowler Group, has such a command and versatility of styles well beyond his years, that pinpointing influences would be a sorry guessing game. Whether it's the yearning, soulful ballad "I Got Eyes" (with wonderful guest vocals by J.R. Roberts) or the flashy fretboard workout of "Jig Is Up," Fowler is already accomplished enough to send a few more tethered blues hounds to bury their guitars in the backyard. Not only is Fowler blessed with enormous talent, he also has the good sense to latch up with Rick Derringer, who produced this nine-song CD as well as contributing guitar on a few tracks. Don't pass up the opportunity to check out this young player who will obviously be a fixture on the scene for years to come. Damon frequently plays at the House of Blues in Orlando, FL. My Day Is Just Beginning from England's Lee Sankey is a debut CD from a young musician / songwriter, and it is a good start for him. He says in the sleeve notes that he doesn't want to be pigeon-holed into one musical category. While this is a good sentiment, it makes the CD a little disjointed. Unfortunately, the CD was spoiled for me by the first track. The track, "Drinking Game," has a good blues beat to it, some nice guitar, and a good horn section. But it is spoiled by Sankey trying to be hip and using the type of language which would get the CD a parental guidance sticker. Maybe I'm old fashioned, but I don't find this clever, amusing, or entertaining. "Only My Baby" and "My Day Is Just Beginning" are attempts at jazzy-blues which are a little bland. However, having gone through the negative points, there are some outstanding tracks on the CD, which make it a worthwhile addition to a blues collection. The third track, "Women & Trouble," has a superb horn section which sounds as though it was lifted from a 60s Atlantic soul record --- it really grooves. "Shout It On Out," "Stone In My Shoe," and "S'picious Woman" are great blues tracks, especially the latter cut, which has a really nice early 60s blues feel about it. I think this was my favourite track on the CD, and I played it over and over. All of the tracks are written and arranged by Sankey, and he plays some good harmonica as well as guitar. Blues Got Me by The Skeleton Crew (Magnetic Heaven) is a live set recorded in Paris, France in December 1998, and it showcases some great blues by this three-piece group from the Manchester area of England. There are only seven tracks, but you won't feel short-changed because the quality of the music is superb. For me, the only weak spot was the cover version of "Hey Joe" mixed with "Voodoo Child," which doesn't quite match the quality of the rest of the tracks. That's not to say that it's a bad version. It's just that the rest of the cuts are so much better. Check out the title track, "Blues Got Me," a bass-heavy driving blues which opens the set, and you'll know that you are going to enjoy this CD. The closing track, "Outlook Black," is a slow, atmospheric blues that put me in mind of some Buddy Guy material. In between these two tracks is plenty of enjoyment for blues lovers --- that Paris concert must have been wow!